You will Watch One Piece Episode 451 English Dubbed online for free episodes with HQ / high quality. Stream anime One Piece Season 13 Episode 30 Come, Final Miracle! Break Through the Gate of Justice! 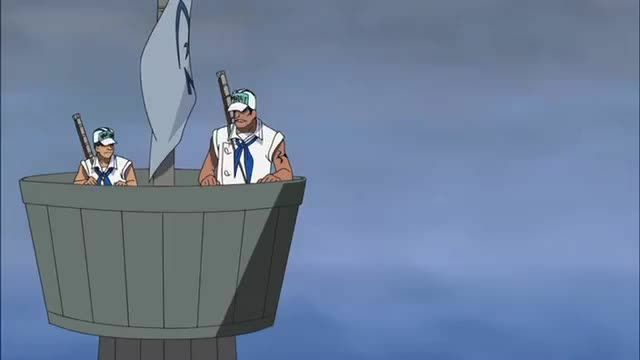 Luffy and the rest of the prisoners make it onto the ship with the help of the whale sharks, but the Gates of Justice are still closed and the ship is under attack by the rest of the Marine ships, and Magellan plans on chasing down the escaping prisoners. Mr. 2 impersonates Magellan and manages to order that the gates be opened long enough to allow the prisoners’ ship to escape, then immediately closed. Luffy is upset to hear of Mr. 2’s staying behind, but comes to accept that there is no other choice, and thanks him over a miniature Transponder Snail. Mr. 2 stays behind to fight Magellan after he realizes what has happened as the other prisoners mourn his loss after passing through the Gates of Justice.